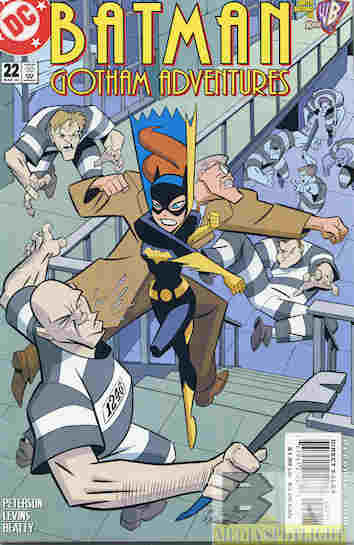 Batgirl and Commissioner Gordon separately answer a jailbreak and end up fighting off a small riot. They learn two brothers escaped and work together to track them down, also finding their sister was part of the break and protecting them. It turns out that their mother was dying and they wanted to see her one last time, but they were too late. When one of the brothers, a serial killer, gets mad at the heroes for slowing them down, the commissioner points out that not only would he have had plenty of time if he didn’t go on a killing spree but many of his victims had families that couldn’t say a final goodbye either. With the three siblings in jail Batgirl spends some time talking to the rest of the Bat-Family before Barbara decides to spend time with her father. What they got wrong: I’m not sure how the title works. I’ve seen a few other titles not make sense but I could be missing something on this one. Recommendation: This is the kind of tale some modern writers claim or act like they’re trying to tell but don’t do nearly as well. It’s about family, has some good superhero and investigative scenes, and was just enjoyable to read without being bogged down with unnecessary grittiness or questionable moral stances. And this was the kids-targeted comic. Worth giving a read and one of my favorite issues in the series, and of the few Batgirl tales I’ve read. Posted by ShadowWing Tronix on December 15, 2018 in Animation Spotlight, DC Spotlight, Television Spotlight, Yesterday's Comics and tagged Barbara Gordon, Batgirl, Commissioner Gordon, DC animated universe, DC Comics, DCAU.